GTAT set to take control of Mesa Operations on Monday. Final Prepayment from Apple could come as early as next week. The city is Mesa is set to delegate the operational rights of the Mesa sapphire plant sub zone to GTAT on Monday. Up to this point the city of a Mesa has acted as the grantee of the Mesa sapphire sub zone operations under approval that was granted in March 2014. According to the FTZ, the grantee (city of Mesa) has maintained the greatest direct control over the sapphire plant zone operations. The grantee also directly bears responsibility and Customs liability for the Zone’s operation. GT as soon as Monday June 2nd may take direct control over the sapphire plant zone operations as well as direct responsibility for FTZ Customs liability. 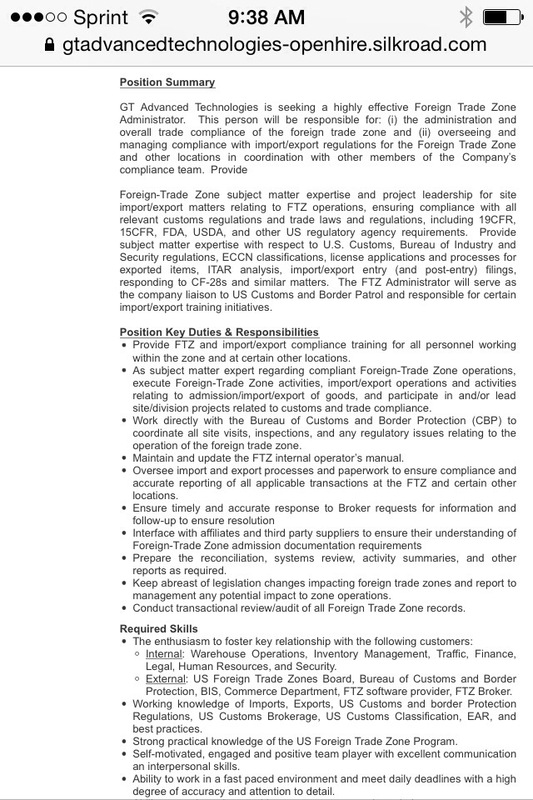 On May 20th GT posted a new job titled “Foreign Trade Zone administrator” to “Provide FTZ and import/export compliance training for all personnel working within the zone and at certain other locations”. GT’s November SEC filing indicated that the company expected to receive the final prepayment in April. 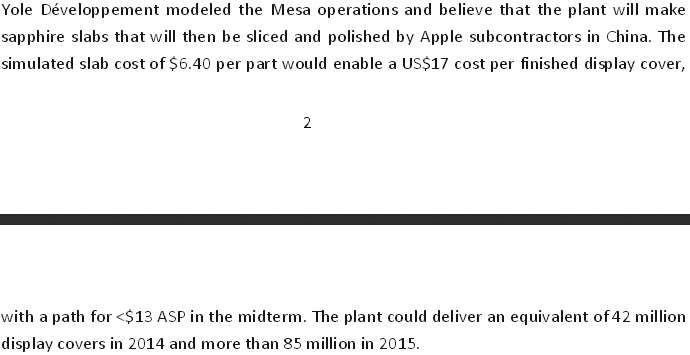 Stephen Chin of UBS, in his recent report published earlier this week indicated that the delayed receipt of the final Apple prepayment might be due to significantly more furnaces being installed at the Mesa facility versus his original estimates. The transfer of the sub zone operations from the grantee (city of Mesa) to GT Advanced Technology on Monday June 2nd might be the final hurdle required before Apple releases the final prepayment of $138 million to GT Advanced. The final prepayment from Apple could be received as early as next week. The Mesa plant is expected to be completed in June. Next week is setting up to be a very interesting week for GT Advanced Technologies. Apple’s WWDC begins on Monday June 2nd. GT is expected to be granted operator status over the Mesa sapphire operations sub zone on June 2nd. GT’s annual stockholder meeting is scheduled on June 4th. The final prepayment of $138 million from Apple could be received by GT as soon as next week. For businesses to use the Zone, save money, and expand or keep their operations in the community, the Zone must be fully operational. Upon a grant of authority, the Grantee must address the processes of administration and operation of the Zone. Some Foreign-Trade Zone Grantees elect to operate their General Purpose Zone themselves. In doing so, the Grantee maintains the greatest direct control over Zone operations, yet also directly bears responsibility and Customs liability for the Zone’s operation. A complete breakdown will come later but here is a sneak peak detailing some of the Mesa sapphire plant activity. Heat exchangers, cooling towers, associate piping and electrical, fan coil units, new exhaust for the UPS and battery rooms. Lighting for north and south end house and pump. BLD2014-01287 ADDENDA TO PACKAGE A02K – DRB016. REF BLD2014-00440. WORK IN CENTRAL UTILITY PLANT INCLUDING HEAT EXCHANGERS, COOLING TOWERS, AND ASSOCIATED PIPING AND ELECTRICAL FOR ADDITIONAL FAN COIL UNITS, I AND C POINTS FOR THE CENTRAL PLANT AND NEW EXHAUST FANS FOR THE UPS AND BATTERY ROOMS. LIGHTING FOR N AND S E-HOUSE AND PUMP HOUSE ALSO INCLUDED. BLD2014-00399 DESIGN PACKAGE – PUMP HOUSE BULDING, A 2000 SQ FT, F-1 OCCUPANCY, TYPE IIB CONSTRUCTION, SPRINKLERED BLDG. GTAT is One of a Kind and Apple knows it! The notion that GTAT is the only company that can deliver Apple’s sapphire goods may have come up on my own but the idea was driven home during TG’s onset interview with CNBC’s fast money on March 17th. During TG’s three minutes on Fast Money he defended he focused on creation of jobs, the unique nature of the Apple project and defended the margin on Apple. Commitment for jobs back in the US, it is a sapphire manufacturing facility thats all we’ve said and Apple has said, it is a rather sizable operation with 1.4m square feet under roof. What we reported on our last call is that we are going to probably going to hit 1,000 employees mid year as a company and things are going well. As you can imagine in that industry surprise is an important element of introducing new products. We are spending a lot of time ramping the facility up. This will be a lower margin but I think the unique nature of what we are doing for Apple and we are probably the only ones in the world who can pull this off put us into a good position. We are not going to be selling commodities here we are selling and making good margins but the fact of the matter is the margins are below the margins we would get for our equipment. This is not just Apple we introduced products that should drive 3 to $5b of incremental market opportunity over the next 3 to 5 years that all are all equipment products in sectors we have entered over the last 3 or 4 years. Why does TG feel that GT is the only ones in the world who can pull this off? Apple already had an existing arrangement with Asian sapphire manufacturers to supply key sapphire components for the iPhone camera lenses and the home button covers. Why wouldn’t Apple just stick with those suppliers and have them grow more sapphire? Why would Apple pour $2B into a sapphire manufacturing facility with a company that has never produced sapphire to this scale? Why are the analysts minimizing the potential size of GT’s recurring revenue stream from Apple? Goldman Sachs is estimated Apple’s sapphire business at $500m 14′, $958m 15′ and 1,039m in 16′ with approximately $1 EPS of their $1.94 2016 estimate coming just from Apple. Does it make any sense why Goldman Sachs values GT at only 12x 2016 earnings when more than half of the EPS estimate is recurring in nature? I think the bottom line is outside of TG and TC and some raving fans I don’t believe anyone in wall street believes GT can pull this cover story off. The wall street analysts have baked in some considerable risk into their price targets because they believe GT’s lack of high volume material business experience is a significant risk to executing the project. I don’t know exactly what Apple will cover in sapphire but I do expect them to surprise just about everyone to the upside. I’m currently estimated Apple revenue at $1,180m 14′, $2,027m 15′ and $2,216m in 16′. My estimated revenue includes revenue for the iPhone, iPod and the iWatch and it assumes a September 2014 launch for all 3 products. If Apple added the iPad to the mix it would add an additional $1,400m a year in revenue by 2016. If you add up my base estimate and as well as the iPad revenue I am modeling out GT’s revenue potential with Apple at just under $4B in annual revenue by 2016 with a future growth rate of 10% annually. It should come as no surprise that my Apple base revenue estimate is double Goldman’s estimate. Goldman’s model does not even assume any new products get introduced with sapphire by 2016. Their 10% growth estimate just assumes an industry unit growth estimate. Are they naive enough to assume that this project will be mature in 2014 and will just make iPhones and that GT’s sales will nearly double in 2015 from 2014 estimates and then grow at a 10% rate annually? Give me a break! Goldman Sachs seems to be doing everything in their power to keep their price target low. They are currently modeling Hyperion at $57m in revenue for 2016 along with a contribution of negative $0.03 EPS. However, by 2018 Goldman expects Hyperion to contribute $1.58 in EPS assuming the middle of the road 60% of TAM and a gross margin of 35%. For clarity this Goldman is assuming GT’s Hyperion sales will jump from $57m in 2016 to $2.25B in 2018. GT’s management is expecting to receive initial orders in 2014 for delivery in 2015 that will exceed Goldman’s 2016 Hyperion estimate of $57m which is roughly 6 Hyperion tool sales. Goldman flat-out does not want to give any credit to GT’s Hyperion opportunity and the way they modeled out 2016 they don’t even need to deal with it. My point here is Wall Street analyst’s are not giving GT Advanced market potential market opportunity with Apple or even Hyperion much respect and it’s time they start thinking outside the box. GT is One of a Kind! TG knows that GT is the only company in the world that can pull off the Apple sapphire project. How many sapphire production equipment makers are there in the world? How many sapphire manufacturing operations are there in the world? How many sapphire production equipment makers are also running sapphire manufacturing operations in the world? There is just 1 company in the world that produces sapphire equipment and also runs a sapphire manufacturing operations in the entire world. That one company is GT Advanced Technologies. I’ve read a lot of material over the last few years related to sapphire and sapphire operations. One of the biggest issues with producing sapphire materials is having the knowledge to run the equipment. It can take months for ASF furnace customers to get their yield up to where they want it. GT sapphire solution includes on site training to help with the knowledge transfer and to reduce the learning curve and help achieve the desired material yields. The biggest issue is customers will not be able to produce the results that GT does in their labs. You know what would be a brilliant idea if Apple selected the only company in the world that actually designs and makes the ASF furnaces and actually uses them to produce materials and has years worth of man hours under their belts testing, innovating and upgrading their ASF furnaces on an ongoing basis. Apple gets GT’s know-how related to the ins and outs of the furnaces as well as the experience of using their best and brightest to run the sapphire operations in Mesa, AZ. There is no other company in the world that can offer the intimate knowledge of the equipment as well as years of experience in actually growing and performing R&D on sapphire products in their lab. 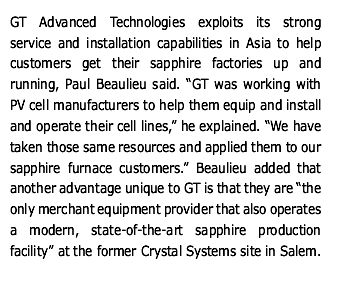 Paul Beailieu GT’s Vice President of sapphire operations in 2011 summed up what gives another advantage unique to GT, GT is “the only merchant equipment provider that also operates a modern, state-of-the-art sapphire production facility. This quote was taken from Yole Developpment’s March 2012 LED Industry Review. If you are wondering how GT got its name GT Advanced Technologies the answer can be found below. It seems clear that GT is in a league of their own with sapphire furnaces as well as developing their other equipment that they acquire (i.e. Hyperion). The quote and image below was also taken from Yole Developpment’s March 2012 LED Industry Review. What is more impressive about the quote and image below is that it came from the director of a rival furnace producer named Oleksandr Lavryk from Pryroda Engineering. Before the entrance of GT Advanced Technologies, the market for sapphire equipment was a case of a ‘Market for Lemons’ as described by Nobel prizewinner George Akerlof, Lavryk told iLEd. 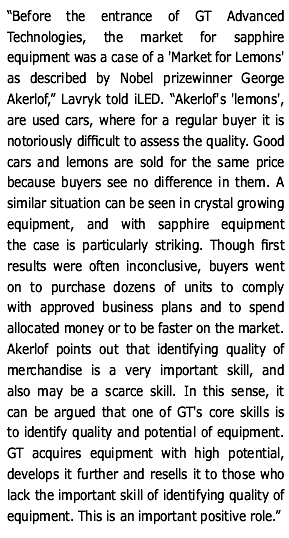 Akerlof’s ‘lemons’ are used cars, where for regular buyer it is notoriously difficult to assess the quality. Good cars and lemons are sold for the same price because buyers see no difference in them. It can be argued that one of GT’s core skills is to identity quality and potential of equipment. GT acquires equipment with high potential, develops it further and resells it to those who lack the important skill of identifying equality of equipment. This article highlights why GT Advanced Technologies is one of a kind, Apple knows it, TG knows it and now every reader of this article knows it. GT may not have the experience of delivering hundreds of millions of sapphire cover screens or ramping up a large-scale operation in just 6 months but they can do it. They are the only company on the planet that produces sapphire growing equipment that also run a sapphire operations. I played high school and college basketball and I had a fantastic basketball coach. Our coach taught us and we ran John Wooden’s famous flex offense. My coach had a great understanding of the offense, he had scouted teams that ran it and played against teams that ran the offense. I have to believe my team would have been even more productive on offense if the legendary John Wooden was coaching us. John Wooden ran the flex offense successfully at UCLA for years and even wrote a book on it. Apple by signing up GT Advanced to buy and operate their ASF furnaces to grow sapphire materials for Apple has added a technological innovation legend to their bench. GT’s equipment knowledge inside and coupled with their years of experience in the lab growing and researching sapphire will produce an astounding amount of sapphire in such a short period of time to cover most if not all of Apple’s devices in 2014. It’s now clear to everyone why GT is One of a Kind and Apple knows it! If you are interesting in following my tweets, asking me a question or just want to give feedback or say hello you can follow me @sapphirecover24 on Twitter. Systems and methods are presented for efficient heating during production of corundum. One embodiment may take the form of a system for processing corundum including a first furnace and a second furnace. The first and second furnaces are sequentially arranged and heat from the first furnace is subsequently used to heat the second furnace. Another embodiment may take the form of a method of operating multiple furnaces in sapphire processing. The method includes operating a first furnace and routing heat from the first furnace to a second furnace. The heat from the first furnace preheats the second furnace. The method also includes operating the second furnace subsequent to the operation of the first furnace. One embodiment may include linking all heating and cooling systems of the growers and furnaces together so that much less heat is wasted and greater efficiencies could be realized. Specifically, furnaces (either or both annealing and growth furnaces) could have their heating and cooling systems linked to other systems through heat exchanges. By staggering the processing schedules among groups of machines, heat that is removed from one furnace could be fed directly into another furnace to reduce the energy input requirement of its heating step. This could be achieved using some thermal fluid (water/pressurized steam, alcohol, solutions, molten salts, and so on) and an insulated network of piping within a cell of linked machines. As used herein, the term “furnace” may generally refer to a heating system or device which facilitates achieving temperatures for either growth or annealing of sapphire. As such, the furnaces referred to herein may include heat sources (e.g., heating elements), insulation, crucibles, and so forth. Yet another embodiment may take the form of a heating system for sapphire production. The heating system includes a heat battery and a plurality of furnaces. Each furnace includes a heat exchanger. The heating system further includes an insulated network of piping in communication with the heat battery and each of the plurality of furnaces. Heat is transferred within the system between the heat battery and the plurality of furnaces via the network of piping and the heat exchangers. Some common and distinct growth methods include Kyropoulos, Verneuil , Czochralski, flux, heat exchange method (“HEM”), hydrothermal, vertical horizontal gradient freezing (“VHGF”), Stepanov (i.e., edge-defined film-fed growth (“EFG”)), and Bridgman (i.e., horizontal moving growth). The Kryopoulos, Verneuil, Czochralski, flux, and hydrothermal processes generate a sapphire boule, whereas the EFG, VHGF and horizontal moving growth processes generate sapphire members having continuous cross-sections. It should be appreciated that although specific examples described herein may refer to a particular process for sapphire growth the examples are not intended to be limiting. As such, the present techniques, systems and methods may be used in conjunction with each of the various sapphire growth processes. Figure 8 below shows how the Mesa facility is likely laid out with a continuous flow of piping and interconnected sapphire growth furnaces and annealing furnaces with equipment closely lined up in an organized matrix to form the most impressive sapphire production facility in the world. I’m going to apologize in advance on this one but I cannot stay inside the box whatsoever. Some of you have commented on the Mosaic theory and I’m going to attempt to push the limits in my next few items. Apple is reportedly using solar power and geo-thermal energy to help power the Mesa Facility. According to the contract document Apple will be using fuel cells, roof solar arrays, a solar basin and an Electrical Substation to manage the power supply to the Mesa sapphire facility. 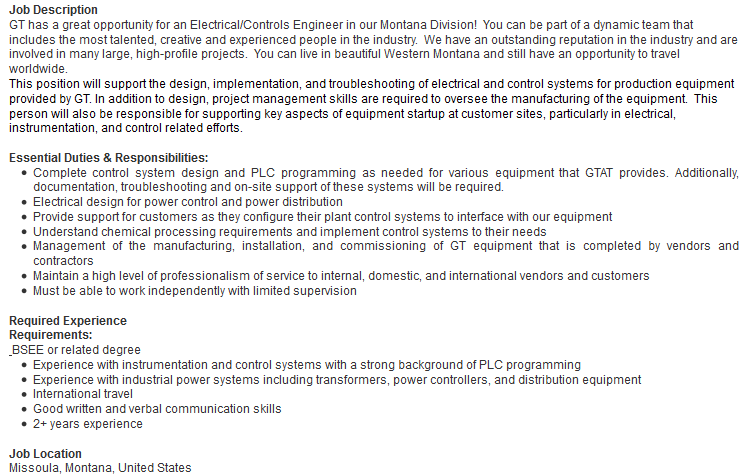 GT Advanced recently posted an Electrical Engineer / PLC Controls position (see image below) on their website to focus on “Electrical design for power control and power distribution” and to “Provide support for customers as they configure their plant control systems to interface with our equipment.” This new position also requires “Experience with industrial power systems including transformers, power controllers, and distribution equipment”. 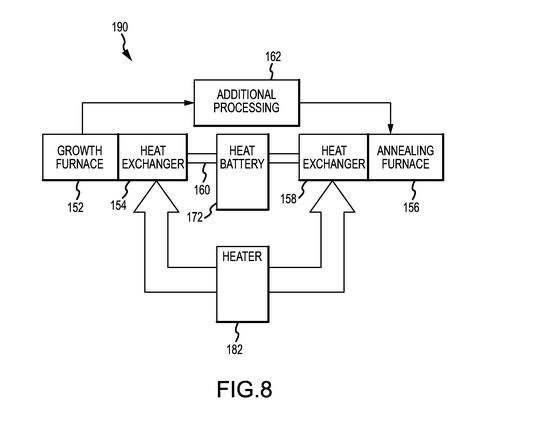 Apple appears to have invented a new heat exchangers process that will rely on using a centralized “heat battery” can hold energy and would need to be distributed and interfaced with GT’s sapphire growth equipment inside Mesa. Apple and GT Advanced Technology have in my opinion designed and developed the most integrated and comprehensive sapphire growth facility in the world. Apple’s recent patents, specifically the continuous sapphire growth and the heat exchangers in sapphire processing patent are game changers in terms of yield per furnace and cost per sapphire cover screens. I want everyone to picture the Mesa Matrix with me. You are envisioning miles of large piping installed within the facility that will carry heat from a heater to the “heat battery,” where the energy and power can be managed by a switch. The heat battery will carry the heat necessary to grow the sapphire and operate the annealing furnaces. On top of the matrix of integrated piping to carry the heat to the furnaces to grow the sapphire crystal each furnace has a continuous supply of raw ingredients and heat to grow sapphire around the clock 24/7 and produce beautiful ribbons or sheets of sapphire crystals. We need to remember that the heat exchangers patent can be applied to various sapphire growth methods including EFG and VHGF. Per the Cradley Crystals website, “EFG method for growing sapphire is used for growing sapphire of any given shape, including tubes, rods, sheets, and fibers. EFG technology makes it possible to get unique shapes and sealed assemblies”. Yes, I repeat any shape including sheets or tubes. Figure 8 depicts the continuous growth process to load alumina into the crucible that will produce sapphire growth ribbons (sheets). Figure 6 depicts cutting the sapphire ribbons (sheets) that have been grown outside of the growth chamber. Apple has managed to take an independent ASF sapphire growth furnace that produces 200 kg+ boule every 25 days and turn their Mesa sapphire factory into a sapphire growth matrix. 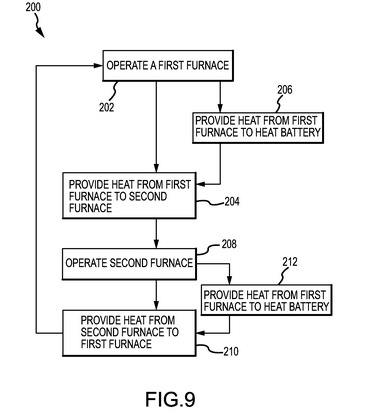 Apple has patented a way to create an integrated heating process taking energy provided by mother earth, store it, manage the power and send the energy in the form of heat through miles of piping within the Mesa, AZ sapphire facility to power thousands of furnaces in a way no one ever thought possible. In addition to the game changing method to provide heat to a sapphire growth furnace, Apple has patented a process that can continuously grow sheets of sapphire crystal in ANY shape their hearts desire. Apple’s Mesa facility production design will significantly lower the cost of growing sapphire crystals due to the continuous sapphire growth method. The patently process will result in less waste, easier fabrication process as well as a significant increase in sapphire crystal yield per sapphire furnace. The continuous sapphire growth patent eliminates the need to start and stop up batch runs to produce sapphire boules, which dramatically increase the sapphire yield per furnace. The sapphire sheets will significantly reduce the fabrication costs versus the cost to harvest a sapphire cover screen from a sapphire boule. The amount of sapphire produced from a ASF furnace will also increase due to the unique shape and form of the sapphire sheets that are produced. This invention is like going from a bread maker in the year 1700 to a bread maker in the year 2014. The bread maker in 1700, mixed the ingredients by hand, used an open flame and made bread in a crucible. After each loaf of bread was baked the bread maker had to clean out the crucible, restart the fire and bake each loaf one by one. Conversely, the 2014 bread maker has an assembly line that takes the raw ingredients and mixes them in a massive storage container. The container has automated process to express the mixed ingredients into crucibles that are shaped any which way. The crucibles carrying the ingredients are carried along an automated belt to a very large oven that transforms the raw ingredients into bread as the crucibles pass through the oven. The key point here is you can throw out any previous calculation on cost of sapphire screens, because the method being used by every other sapphire growth manufacturer is still stuck in the year 1700. Apple and GT have advanced the design and method to grow sapphire by hundreds of years so to speak. The sapphire that will be produced at the Mesa sapphire facility owned by Apple and operated by GT will be mind-blowing. These new patent developments open up the door that Apple can cover any iDevice they want with sapphire crystal in 2014. Apple and GT have revolutionized the sapphire crystal growth process and it’s time for me to take off my cap and give both companies a standing ovation for their innovation, vision and ability to deliver game changing technology at an affordable price! I hope you have all enjoyed the journey through the Mesa Sapphire Matrix and that each and every one of you now has a full vision of what it will look inside Apple’s 1.3 million square foot sapphire manufacturing facility. PatentlyApple broke some more patent news related to Apple and GT Advanced this morning. 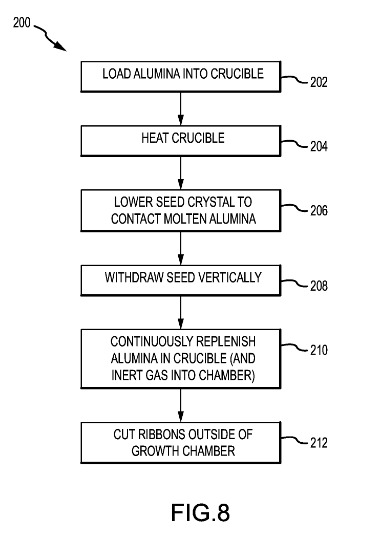 The latest patent allows for sapphire crystal to be pulled away from the crucible and fed out of the growth chamber. This invention would certainly reduce the lead time to grow sapphire and allow for GT and Apple to significantly increase the sapphire yield per ASF furnace. Additionally, due to the increased yield the capital costs for equipment would be considerably lower versus the traditional sapphire boule growth method used in ASF furnaces. Lower capital costs would also drop the cost to produce sapphire screens as well since depreciation costs would be lower throughout the production process. Furthermore, this new invention if being used inside the Mesa operation today would allow for Apple and GT to rapidly produce inventory versus the traditional sapphire growth method. Patently Apple also notes that Apple is most likely using this invention in their Mesa sapphire plant because the patent was originally filed in Q3 2012. This date was also ties in well to when GT and Apple signed their confidentiality agreement which was in August 2012. Apple credits Dale Memering and Scott Myers as the inventors of patent application 20140090592 which was originally filed in Q3 2012. Considering that this is a patent application, the timing of such a product to market is unknown at this time. However, in this case, Apple is likely using this invention in their new Sapphire plant in Arizona. 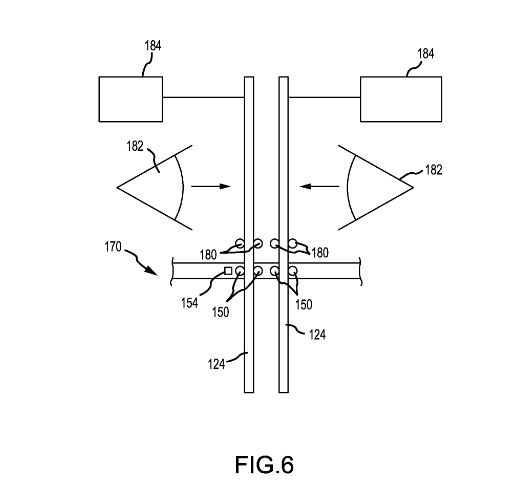 Apple’s invention generally relates to systems and methods for continuous sapphire growth. One embodiment may take the form of a method including feeding a base material into a crucible located within a growth chamber, heating the crucible to melt the base material and initiating crystalline growth in the melted base material to create a crystal structure. Additionally, the method includes pulling the crystal structure away from crucible and feeding the crystal structure out of the growth chamber. Another embodiment may take the form of a system for continuous sapphire growth including a vertical growth chamber and a crucible positioned within the growth chamber. The crucible includes a die set and is configured to hold molten alumina. The system also includes a heater configured to heat the crucible and a feeding system for continuously feeding alumina into the crucible. A pulling system is provided and configured to contact a seed crystal with molten alumina at the top of the die set and pull a crystal ribbon upwardly and out of the growth chamber. A job posting today on GTAT’s website for Accounts Receivable/Invoicing at GT’s Mesa location coupled with other recent news detailed below is a clear indication that GT will likely commence sapphire shipments to Apple prior to July 1st. The job specifics are below but in short the new position will; post and record accounts receivable data, create and mail client statements, maintains spreadsheet of outstanding invoices. The new job is clerical in nature, but is required to have in place before revenue is generated and managing your accounts receivables and customer billing becomes a priority. Appleinsider recently reported that Apple was targeting June to complete the Mesa expansion, which is another signal that the 9 Mesa plant phases are nearly completed within the Mesa sapphire plant. The supply chain has recently announced production ramp ups for the A8, display panels, batteries and memory. Pegatron is adding new workers and is reportedly set to begin their iPhone manufacturing ramp up in Q2. After I factor in all of the recent news, it seems clear that GT is now very close to commencing sapphire shipments to Apple themselves and recording meaningful revenue sometime in Q2 2014, ahead of the upcoming iPhone 6 launch. The person will be responsible for interfacing directly with the Corporate Accounting Department, both on the phone and via email. This individual will be in charge of the billing aspect of accounts receivable for the Mesa, Arizona manufacturing facility. The person will be responsible for ensuring that all the Company’s sales are properly billed, according to agreed-upon terms and conditions, in a timely manner. In addition, email invoices to customers on a daily basis, review and process credit memos, and reconcile customer receivable balances. Create client statements and mailing them monthly. Maintains a spreadsheet per client that includes a list of outstanding invoices, invoice due dates and the amount of time the invoice has been outstanding. When clients are paying an invoice, might be responsible for contacting them to determine when payments will be made. Generates multiple AR accounting reports and disseminating them within the accounting department. Participates in accounting system close procedures, typically on a monthly, quarterly and annual basis. Filip Truta is reporting that a French site has gotten a hold of leaked documents that detail the 4.7″ and 5.5″ iPhones. The leak alleges that the iPhones will come in 2 version N56 and N61 models 402/401 and will have sapphire covering the front and back of the device. This development if it is indeed true opens the door up significantly for other options including solar charging. I’ve followed Filip’s work for a while and this isn’t the first time he brought up the idea of Apple returning to a double sided glass iPhone and it only makes sense if sapphire is going to be used. The talented Martin Hajek, tapped by the Frenchies at Nowhereelse.fr (who obtained the leaked documents), has created a few mockups based on the purported schematic. He achieved the image displayed above (click to enlarge). “…assuming that the illustrations below are true, the iPhone 6 would be declined in two versions (N56 / N61 and 402/401 models) respectively equipped with a screen of 4.7 inches and 5.5 of diagonal,” according to the French site. “Visibly thinner than the current iPhone 5s (7.1mm thick according to my source), first note that the edges of the iPhone are slightly curved unlike those of previous generations with four slices were flat,” reads a rough machine translation of the report. What happens to the Apple contract if GTAT is acquired? From time to time I read different comments about different companies that may want to acquire GT Advanced, ranging from Corning, Apple, GE and others. I don’t believe GT is at risk to be acquired but what would happen to the Apple materials contract if GT was to be acquired? According to the master development and supply agreement the contract between Apple and GT is not a joint venture or partnership and neither party has the power “to act for or in the name of or to bind the other party”. Furthermore, Apple the contractual agreement does not allow GTAT to “assign, delegate or otherwise transfer this Agreement, any SOW, any Purchase Order” without the prior written consent of Apple. Additionally, if any “Change of Control,” i.e. if GTAT more than 50% of GTAT’s voting power is acquired by a “person, or entity, or group of related entities,” without prior written consent of Apple, the agreement will be null and void. 8. Relationship of Parties. Nothing in the Agreement creates a joint venture, partnership, franchise, employment or agency relationship or fiduciary duty of any kind. Neither party will have the power, and will not hold itself out as having the power, to act for or in the name of or to bind the other party. Except as expressly provided, the Agreement is not for the benefit of any third parties. 9. Assignment. This Agreement is personal to GTAT, and GTAT may not assign, delegate or otherwise transfer this Agreement, any SOW, any Purchase Order, and/or any right or obligation thereunder without the prior written consent of Apple. Unless otherwise defined in a SOW, a Change of Control, as defined below, will be considered an assignment of this Agreement. Any purported or attempted assignment, delegation, subcontracting or other transfer, in whole or in part, without such consent will be null and void and will constitute a breach of this Agreement. Subject to the foregoing, this Agreement will be binding upon, and inure to the benefit of, the successors, assigns, representatives, and administrators of the parties. “Change of Control” means (i) any sale or exchange of the capital stock by the shareholders of GTAT, or any GTAT Related Entity that makes, uses or sells, or offers services in connection with, sapphire production or processing equipment or sapphire goods or material, in one transaction or a series of related transactions where more than 50% of the outstanding voting power of GTAT, or of GTAT’s interest in any such GTAT Related Entity, is acquired by a person or entity or group of related persons or entities; (ii) any reorganization, consolidation or merger of GTAT or any GTAT Related Entity where the outstanding voting securities of GTAT or such GTAT Related Entity immediately before the transaction represent or are converted into less than fifty percent 50% of the outstanding voting power of the surviving entity (or its parent corporation) immediately after the transaction; or (iii) the consummation of any transaction or series of related transactions that results in the sale of all or substantially all of the assets of GTAT or any GTAT Related Entity, other than where the entity acquiring shares or assets, or the surviving entity with respect to clause (ii) above, is GTAT or a wholly owned subsidiary of GTAT. Apple has put significant value and protection in place on GTAT’s sapphire technology and know-how by negotiating “voiding” power over the existing agreement if GTAT is acquired. The contract language does open the door for Apple to acquire GTAT for their own benefit, since they hold the power of consent, but I don’t believe this will ever come to fruition. Apple’s business model is drastically different from Samsung, who sources 75%+ of the components for their electronics devices themselves. Apple has never owned the component suppliers of their iDevices, but they are increasing their involvement within their current supply chain. A recent report also indicated that Apple was going to use robots on their battery assembly line. Apple appears to be sending a clear message that they are trying to reduce costs and improve lead time for new product launches by driving automation. Apple’s deal with GT Advanced went as far as buying a building for GT to grow sapphire material for Apple’s iDevices and investing almost $2.0B in capital for the facility. The GT Advanced contract and ensuing capital investments were a significant step towards controlling and owning part of the supply chain, but I just don’t see Apple acquiring GTAT, because it is just not their way of doing business, for now. I just returned from a well needed vacation and I am officially back to sleuthing. One of the first items I want to draw attention to is the confidentiality agreement that GT Advanced signed with Apple on August 24, 2012, which was referenced within the Master Development and SOW Agreement between Apple and GT (see image below). While the exact date is not relevant by itself, the date does establish a starting point for the seriousness of Apple and GT’s relationship. I also went back and reviewed the comments made by GT management during the Q3 2012 conference call right after the confidentiality agreement with Apple was signed to see what kind of signs management gave investors related to sapphire screen pricing and expected timing. At this point for those of you who follow my analysis and GT advanced closely it should not come as a surprise to anyone that GT’s management provided a lot of color on the pricing and expected timing during the November 2012 conference call. There’s been a lot of discussion regarding the cost of sapphire for cover screens and question as to whether the cost range that we recently published of $10 to $20 above current glass solutions is achievable. The total cost for sapphire cover screen can be divided into 2 categories: crystal growth and fabrication, with each currently representing about 50% of the total cost. I’m just saying that, that’s a factor what the throughput of the furnaces might be in terms of cycle time, what the cost of the consumables might be, etc. There are already a lot of tools in the fabrication area that will have application, that are either depreciated significantly or are already in place and some of those operations that we’ll support. There are some really innovative technologies that are being developed by ourselves and our fabrication partners that would bring the back end down very substantially in the fabrication area. I expect that the ratio between the crystal growth side and the fabrication side to change substantially as these technologies get put on-board. But we’re confident, okay, that we can be inside that box. And we’re also confident that, that’s just the initial box. And unfortunately, with the big smartphone players, you won’t know until it happens. We’ll start laying down assets second half of next year, but you won’t see a high-volume phone with sapphire on it, I don’t think, until 2014. And so that’s consistent with the time line that we’ve put in place. I provided a lot of information that was given during GT’s Q3 2012 conference call, so what right? Well one of the first points I want to draw attention to is the price $10-20 above current glass solutions costs. The number widely used has been $3 per screen for the current glass solution. If we take midpoint of $10-20 it is $15 above the $3 per screen current price. As of November 2012 GT could grow sapphire boules and produce sapphire cover screens for approximately $18 a screen. Add in your 25% margin and they could sell to Apple for $22.50 per screen. GT management also stated that the price was a 50/50 split between crystal growth and fabrication which would be $9 to grown and $9 to fabricate for a total cost per screen of $18. Eric Virey from Yole Développement early this month modeled the price of sapphire screens. Eric assumed GT would grow the sapphire boules and deliver a sapphire slabs (bricks) for $6.40 per screen and sell for $8.00 per screen (see image below). The sapphire slab end up in China where it would be sliced and polished by Apple subcontractors. The finished screen’s estimated cost is $17 with potential to be as low as $13 per screen in the mid-term future. 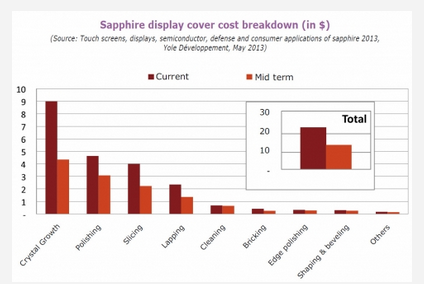 May 2013, Eric Virey estimated that the cost of sapphire screen was $22 but could ultimately reach $13 per screen over time (see quote and chart below). What is even more interesting is estimated mix of sapphire growth versus fabrication costs compared to GT guidance of 50/50 split. Virey estimates that the sapphire growth costs as of May 2013, were $9 for crystal growth and $13 for fabrication, which represents a 40/60 split versus 50/50 from GT management. If I bring down the fabrication cost estimate from $13 to $9 the split is now 50/50 and the total cost is estimated at $18, equal to GT management’s guidance. Today a cell phone cover glass costs around $3. Sapphire will always be more expensive than this. Yole Développement has also produced a detailed cost simulation, showing that today it’s possible to make a sapphire cover for around $22. That must fall. In an aggressive and optimistic yet realistic hypothesis we predict that the cost could go down to below $15 within two years, and ultimately could reach $13. The wall street analysts have not gotten down to the granular details related to if GT will sell sapphire slabs or if GT will grow the boules, slice the sapphire and polish the screens. Many of them don’t even have a unit or cost estimate per screen that has been published. I think it is very important to know who will be ultimately making the sapphire screens and what GT’s selling price per screen will be to Apple. The cost of the screen will impact Apple’s margins, but will the price of sapphire screens hurt the bottom line as much as some analysts are expecting? The short answer is no and I will explain why. GT in 2012 was pricing in the cost of sapphire screens using the previous generation ASF furnaces (115 KG) as well as the previous generation diamond wire saw from Meyers Burger. Additionally, the raw materials supply chain for Alumina had not been established. If we fast forward to March 2014, GT is now using a (200 KG+) furnace which represents an improved yield of 74% from the ASF 115 KG Furnace. GT will likely be using the next generation Meyer Burgers diamond wire cutting saws that will substantially reduce kerf loss and improve the fabrication costs to make a sapphire screen. A $80m order was received by Meyer Burger for diamond wire cutting saws in December 2013 and it is widely believed that the order was ultimately headed for Apple’s Mesa, AZ sapphire plant. GT acquired exclusive rights to Intego GmbH sapphire cover inspection tool on March 13, 2013 that is expected to increase the amount yielded (useable portion) from a sapphire boule, which will lower the cost of growing and fabricating sapphire screens. According to GT’s comments (see image below) regarding the LED Intego inspection tool, it provided an improved yield of 20-25% in the lab and I would expect the sapphire cover inspection tool to show similar yield improvement . It has also been evidenced (see image below) that GT has already received several Intego sapphire cover inspection tools so this technology that was in R&D in 2013 is now ready to go in 2014. So what is the cost of sapphire cover screens? GT’s improvements to the sapphire screen production cost estimates include; sapphire boule is now 74%+ larger than it was in 2012, the inspection tool that improves the yield by 20-25% since 2012 (useable boule), Apple’s negotiations and establishment of the current raw material supply chain may reduce the cost of raw materials by 20-25% from 2012 estimates and lastly the next generation of Meyer Burger diamond wire cutting saws will substantially reduce kerf above and beyond the previous diamond wire saws that were commercially available in 2012. I’ve been modeling out the cost of a sapphire screen at $8 for a final ASP of $10 to Apple. Given the facts at hand, I feel comfortable that my cost estimate for 2014 is reasonable. A $7 increase ($10 cost versus $3 for glass) to Apple’s cost structure will certainly impact Apple’s gross margins, however my estimated sapphire screen incremental cost estimate of $7 per screen is probably half or one-third of what the street is currently modeling for the cost of Apple’s sapphire screens. So yes, sapphire screens will have a negative impact on Apple’s gross margin but sapphire screens will not “tank” the iPhone 6 margin profile by any means. Below are my key points regarding pricing summarized in a chart as well as a repeat of one comment made by TG during the Q3 2012 conference call. But we’re confident, okay, that we can be inside that box ($10-20 above current glass solutions). And we’re also confident that, that’s just the initial box. A new patent has emerged from Apple related to Oleophobic Coating, which has been widely used to protect Apple screens from oily fingerprint smudges since 2009. The patent has never been applied to sapphire screens until now so this development is another major milestone for Apple and GT Advanced towards the production of sapphire screen for Apple iDevices. Appleinsider reported on the patent news this morning. This application claims priority to and the benefit of U.S. Provisional Patent Application No. 61/704,275, filed Sep. 21, 2012 and titled “Oleophobic Coating on Sapphire,” the disclosure of which is hereby incorporated herein in its entirety. The subject matter of this application relates generally to surface coatings on substrates. In particular, the application relates to oleophobic coatings and other surface coatings on substrates for uses as windows on electronic devices, including, but not limited to, mobile phones and portable computing devices. Electronic devices may include a range of different touch-sensitive input surfaces, for example as incorporated into displays, track pads, keyboards, and combinations thereof. In use, however, oils and other deposits may affect appearance and performance, particularly where information is also displayed on the touch-sensitive surface (e.g., on a touch-sensitive display). In general, the use of sapphire materials provides substrate 200 with substantially increased hardness, as compared to silica-based glass and other materials. For example, substantially single-crystal forms of sapphire glass may have a hardness of up to about 2000 points on the Vickers scale (about 19.6 GPa), or in a range of about 1800-2300 points on the Vickers scale (about 27.7-22.5 GPa). Alternatively, sintered polycrystalline forms of alumina or sapphire glass may have a Vickers hardness of about 1200-2000 points on the Vickers scale (about 11.8-19.6 GPa), depending on grain size, and fused amorphous forms may have a hardness of about 1000-1200 points on the Vickers scale (about 9.8-11.8 GPa). Alternatively, base layer 202 may be formed of an amorphous aluminum oxide, transparent alumina or other sapphire-like material, for example by thin film deposition, sintering, vapor deposition, or other process. In these examples, base layer 202 may also include a combination of amorphous and polycrystalline components, in order provide a selected combination of transparency and hardness. In the particular configuration of FIG. 3, deposition units 226 are provided in the form of physical or chemical vapor deposition (CVD or PVD) components. Alternatively, other processes and components may be utilized, for example to treat substrate 200 by sputtering, electron beam deposition or electron beam evaporation, or a combination of such processes.